Ceratophyllum demersum is a submersed, rootless aquatic perennial herb, stems thin, long, branched, branches often modified into root-like rhizoids. Leaves in numerous whorls of 5-12, 1-3 cm long, to 0.1 cm wide, linear, somewhat stiff, usually forked once or twice into 2-4 segments, one side with sparse, back curved teeth. Flowers inconspicuous, sexes separate, axillary, males above female, surrounded by 8-10 bracts (sepals) fused at base, 0.1-0.2 cm long . Fruit 1-seeded (achene) 0.4-0.6 cm long spine tipped and with two basal spines. Habitat: Still, open water of ponds or slow rivers and streams; pH 6.2-8.3 (USDA 2006). Notes: Can be quite aggressive in warm, nutrient rich water. 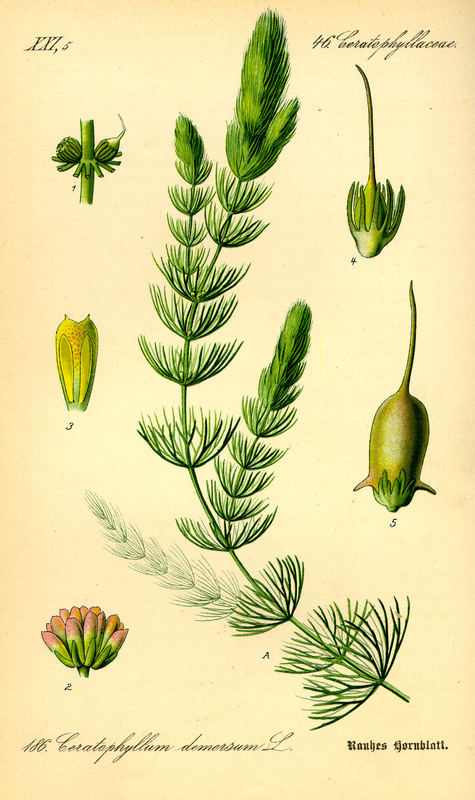 Often mixed with milfoil, Myriophyllum spp. (USACE 2002).